We’re excited to finally share a preview of the iThemes.com redesign. We’ve been working on the redesign for months (and dreaming about it for years), and we hope you’ll be just as excited to see the new site as we are to get it launched. We plan to post more screenshots of the redesign over the next few weeks, but we couldn’t wait to share a sneak peek of the new iThemes.com homepage today. Q. What are some of the objectives you hope to accomplish with the design of the new iThemes.com? Brad: It’s been 3 years since iThemes.com has had a fresh coat of paint. And over the years we’ve built things on top of older systems of organization and attached new things here and there. So we wanted to make sure we organized everything in a way that we could properly build on top of moving forward. We’ve built modified custom post types for a lot of the content on the site – products, team members and ebooks for now, and more coming in the future. We’re consolidating a lot of things and trying to make it easier for people to understand the connection between all the things we offer – themes, plugins and training. A redesign has always been a major project we’ve wanted to do, but hadn’t had time to tackle. And the longer we waited, the bigger the project got. So a few months ago we had the first talks about making it happen and making sure that everything we did would make the next iteration easier too. Ty: For me it all boiled down to two basic objectives, one of which will benefit us and the other benefiting visitors of the site. The current iteration of iThemes.com has had a few years worth of adding and changing and building and it had become rather convoluted and difficult to keep updated. So the first objective, which helps us internally, was to reorganize content and design a better system for managing the site moving forward. Secondly, for the benefit of visitors/users of the website, we wanted to make it easier to understand all of the products and services that iThemes has to offer, which means we took a step back, looked at the big picture of what iThemes offers, and then laid it all out in a much more pleasant manner. Q. What do you think users will appreciate most about the new site? Brad: I think other than just the overall look, users will like the new theme sorter most. As well as the new login area. It’s going to be super cool. Ty: I think that users will most appreciate the overall aesthetics and ease-of-use. The new site will provide all of the same information that we were already putting out there, but in a way that is much easier to find and dig into. I also believe we’ve done a great job of providing a fresh new look without losing the iThemes face that we all know and love. Q. What’s your favorite part of the new site? Brad: My favorite part is that our site is finally going to be on Builder. We all love Builder and we use it for every new project around here, big and small. So we’re going to be “eating our own dogfood” soon and using it for our own site. It’s going to make the development and quick changes on the new site so much easier. Ty: My favorite part of the new site will be its interactions and responsiveness. The new look is basic and simple, but we’ve put a lot of time and care into the small details that will really keep a user engaged with the page. It’s going to be one of those sites that is enjoyable to just look around, move your mouse over things to see what new content or interaction you can find that you hadn’t seen before. That kind of stuff is super fun to me! Q. What role has collaboration played in the redesign? Brad: It’s been great working with Ty on the new site. I can do a lot on my own. But Ty is a great designer, a much better coder than me, and he’s super fast. It’s nice to be able to pass off a .psd and a couple days later, work together to figure out how the interactions and responsiveness of the site will work. We also had Chris and Koop lend a hand with some of the post types and server setup. 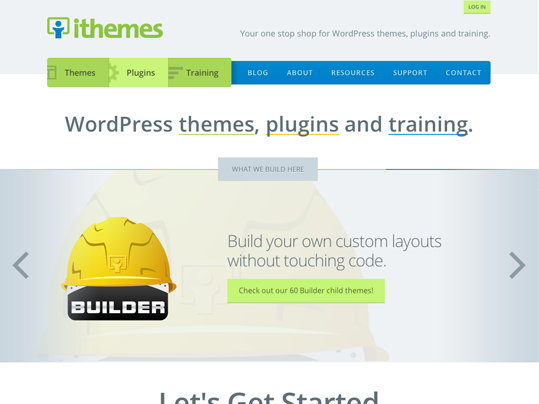 Koop built us an iThemes Builder Block for all our content needs. It’s so easy to work with on the back end. Ty: I’m so thankful for the team that I get to work with on a daily basis. I’m consistently blown away by the amount of talent that resides inside these walls. My eyes would light up when Brad would send me a new Photoshop mockup of a page, and my chest leap as Koop would show me latest version of the iThemes Builder Block that he built for our custom post types. This will prove to be a project that I’m truly proud to be a part of! We expect to launch the new iThemes.com in August. This is very exciting to watch. I am really looking forward to seeing what you guys have done. The new theme sorter sounds GREAT!